Years ago, I found two old rolls of uncut black and white film negatives in one of my dad’s old shoe boxes. 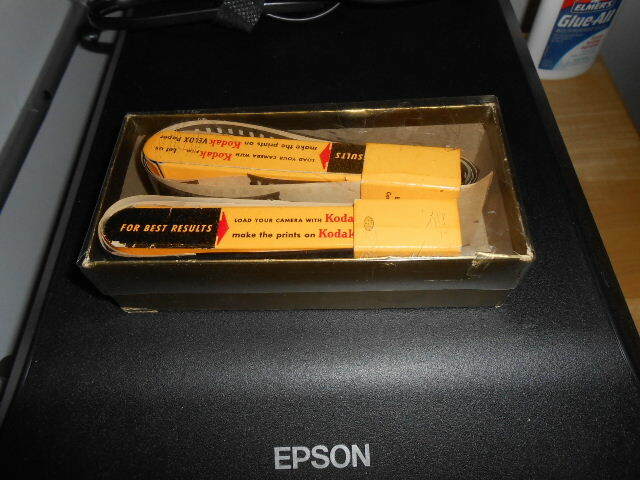 The negatives were rolled around a thin sheet of paper in the Kodak box they came in. They must have been for the 40s or the 50s. Holding them up to the light, I tried to see if I recognized any of the images, but they were unfamiliar to me. My dad had no clue what was on the film. It took almost 30 years before those negatives revealed their secrets thanks to a scanner. I took the negatives to several businesses that processed film to get prints made. Either they refused out right (“we don’t have the equipment for that”) or charged an exorbitant price to do the work. Other than a vague idea that the images were of relatives, I couldn’t bring them to life. I packed the negatives away when I moved 7 years ago and forgot about them. Last summer, I came across several hundred negatives that belonged to my grandmother. I was itching to know what these were photos of. For my birthday, my family bought me a scanner. It does everything from documents to color negatives and slides. You can read my review of the Epson V550. I hooked up the scanner almost immediately and scanned every negative I could get my hands on. As I was rummaging through a box, I came across another box. I opened it. Oh my goodness! Inside was those rolls of film negatives! Would my new scanner be able to scan them? It took a little work. The rolls were curly and unruly. I didn’t want to, but eventually I cut them into strips for easier handling. What was on These Negatives? One after another the images came to life. It was like I had opened a Lassalle Family Time Capsule dated 1955. A few of the photographs I had seen before. My mom and dad sometimes took my grandpa on little trips while my grandmother tended to her mother who was very ill. 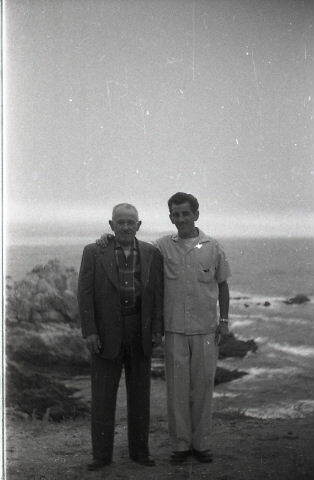 This is my dad and grandpa in Monterey, California. The rest were new to me. 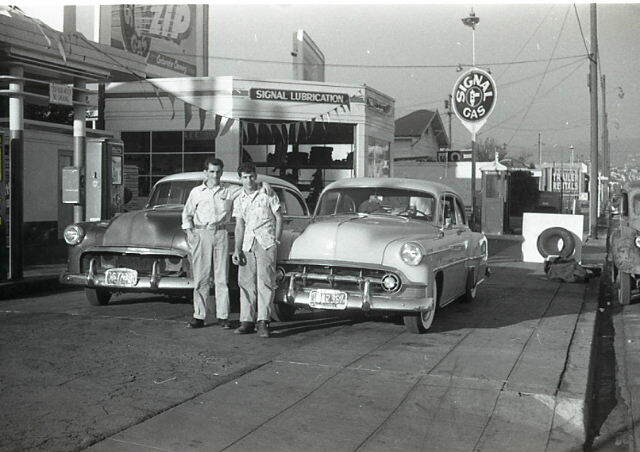 One group of photos were taken at the gas station that my dad and his brother, Eugene, owned in Oakland, California. They loved working on cars and even had a racing team for a while. My dad is on the left and his brother is on the right. The Lassalle’s were known for their family dinners. I only remember them vaguely. Very few photographs have survived from these get-togethers. Most of the ones I have in my possession are blurry or grainy. This get-together is before my time. My dad and his siblings are all in their 20s, just starting their families. Everyone’s young and vibrant. 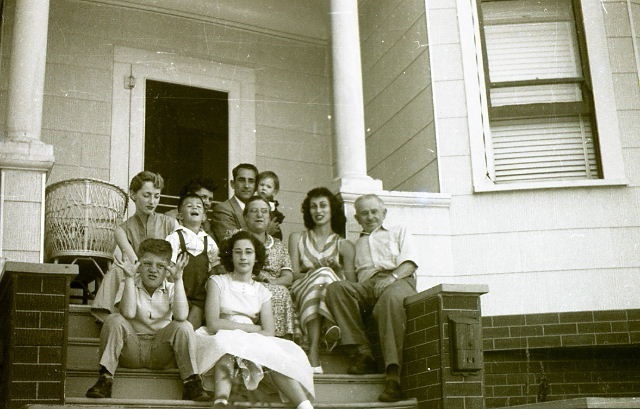 I got chills when I looked at the photo of the whole family on the front steps of Grandma and Grandpa’s house in Oakland. Was this before or after filling up on Grandpa’s famous soup and the wine he made in the basement? I have fond memories of this house. There was a laundry chute between the basement and the kitchen. We weren’t supposed to climb through it, but what child could resist during a game of hide and seek? Especially because you could run through the basement, down the side alley, and up those same front steps. Our house couldn’t do that! 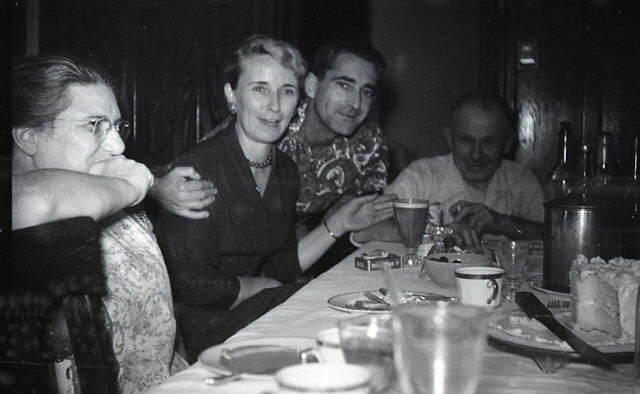 In this photo, the family is gathered at the long dinner table that Grandma Lassalle lovingly set. Grandpa Lassalle is at the head of the table. My Uncle Art has his arm around my Grandma Shellabarger. But look at my Grandma Lassalle on the end! She rarely smiled for photographs, but someone has caught her giggling. Maybe a little too much wine, Grandma? I feel like I’ve stepped back in time to a place I’ve only known from stories. A time of healing after the heartbreak of Uncle Charlie’s death in World War II but, before the divorces and premature deaths of children. 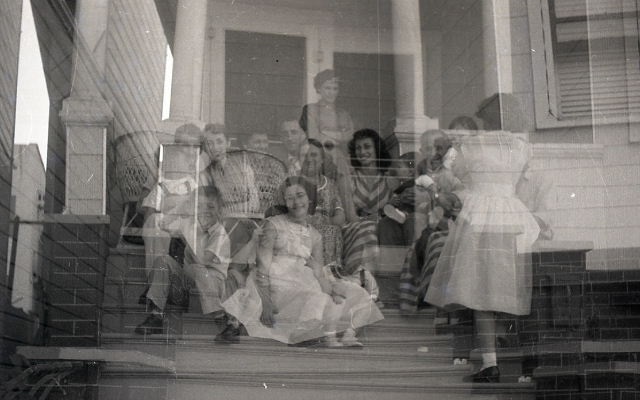 Call me crazy, but off the photographs on the roll, this double exposure is my favorite. The minute I opened it I couldn’t help feel a chill. Several of the people in this photo have long passed away. It’s almost as if their spirits got caught watching over the gathering. It’s been an incredible experience looking at these old, lost photographs. They are even more special because they aren’t stiff portraits, but snapshots of every day life. My family in its natural habitat. At one time I thought of throwing them away because I couldn’t get them processed. I know. The horror! Imagine the loss! I am so glad my dad saved everything. I’m glad that I held on to them because many of these photos no longer exist in print. Wherever the originals are, they weren’t in my dad’s photo album. My only regret is my dad died before I was able to scan them. He’d have loved to have seen these old photos again. I am sure he could have added commentary that would have made the photos even more special. I’m so happy to add these photos back to the family collection for everyone to share. This article was written for the September Genealogy Blog Party at MyDescendantsAncestors. Thank you to Elizabeth O’Neal for the Lost and Found theme. I also have a film scanner and have scanned some old negatives (prior to 35mm). It is so neat when you can see the image on the screen. Angela, It’s wonderful when you bring those old negatives to life. Many of the photos I scanned hadn’t been seen by anyone for decades. Most were new to me even those from my childhood.